Academic life of an adolescent is marked by complex challenges, motivations and problems, which make it stressful. Importance of mindfulness in stress management among youth was studied by assessing the stress level before and after exposure to mindfulness- based program. 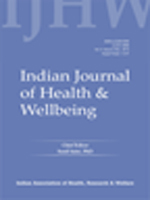 Results suggest a significant reduction in the stress level after exposure to mindfulness program that was based on Indian knowledge system. Benson, H. (December 1997). The relaxation response: Therapeutic effect. Science, 275(5344), 1693-1697. Biegel, G.M., Brown, K. W., Shapiro, S. L., & Schubert, C. M. (2000). Mindfulness- based stress reduction for the treatment of adolescent psychiatric outpatients: A randomized clinical trial. Journal ofConsulting and Clinical Psychology, 17, 855866. Chickering, A. W., &Reisser, L. (1993). Education and Identity. SanFransisco: Jossey- Bass. Heydenfeldt, J.A., Herkenhoff, L., & Coe, M. (2011). Cultivating mind fitness through mindfulness training: Applied neuroscience. Per/brma«ce/mproveme«f, 50(10), 2127. Kuyken, W., Weare, K., Ukoumunne, O., Vicary, R., Motion, N., Burnett, R., Cullen, C., Hennelly, S., & Huppert, F. (2013). Effectiveness of the mindfulness in schools programme: Non-randomised controlled feasibility study. The British Journal of Psychiatry, 2,126-131. Shapiro, S.L., Schwartz, G.E., & Santerre, C. (2002). The effects of mindfulness-based stress reduction on medical and pre-medical students. Journal of Behavioral Medicine, 21,581-599. Tang, Y.,Ma,Y., Wang, J.,Fan, Y.,Feng, S., Lu, Q., Yu, Q., Sui,D.,Rothbart,M.K.,Fan, M., & Posner, M.I. (2007). Short-term meditation training improves attention and self-regulation. PNAS,104(43), 17152-17156.